Football and in particular, Accrington Stanley Football Club has the ability to engage people, improve community cohesion and raise the hopes and aspirations of the people of Hyndburn. As a Club we are committed to ensuring that we respond to local needs whilst working strategically in line with regional and national agendas. We all recognise that sport can play a prominent role in addressing major issues such as obesity, anti-social behaviour, health, employment and attainment. Through key partnerships and a robust multi-agency approach, we ensure that we can achieve our aims and objectives effectively and efficiently. Our partnerships work underpins the entire scheme delivery programme and enables us to work strategically within Hyndburn. These relationships enable us to engage with underrepresented and hard to reach groups. 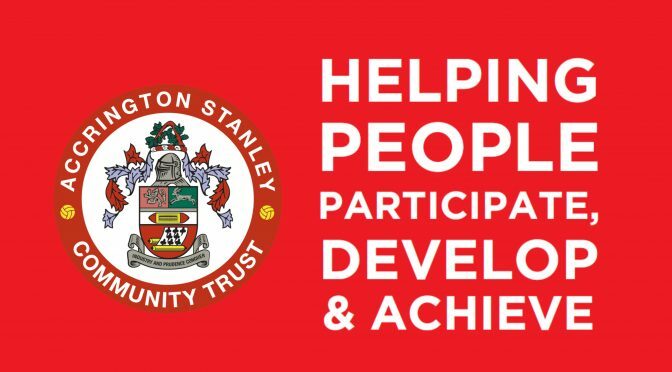 “Use the power of Accrington Stanley Football Club to improve the lives of the people of Hyndburn through participation in sport and exercise”. Our mission is to support the local community regardless of age, gender, race, religion or skill level and promote a healthier lifestyle through sport and education by encouraging individuals to take part in fun based activities, which develop confidence, co-operation and education. Increase participation in Sport & Exercise. Promote wellbeing and healthy lifestyles within local communities. Deliver an inclusive programme of activities that involves and engages hard to reach groups, improving community cohesion. Develop and empower leaders, coaches and volunteers. Engage and inspire young people, raising and celebrating educational achievement. Govern the operations of ASCT efficiently and effectively.